I remember I always complaining about how hard to get Asian ingredients to cook with in this town (Where I live). But if I think differently, there are so many ingredients that I’ve never seen in Korea, so I can play with it and have new experiences. Why don’t I just be grateful what I can get from here, and be even more creative!! Right?! Today, luckily, at farmer’s market. I found this beautiful egg plants. I bought some mixed okra, green tomato and red chili today. 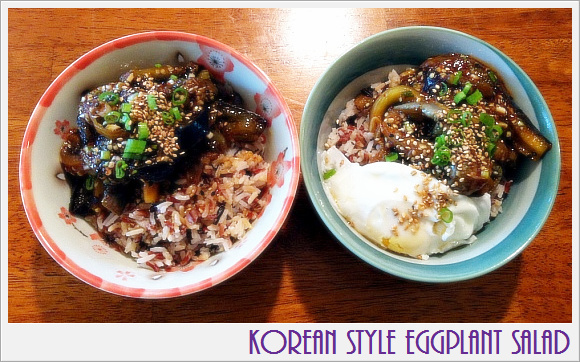 I was craving Korean style eggplant salad (Gaji-Namul / Gaji-Muchim). So I made it for breakfast this morning! I served it over the cooked wild rice. OMG, I haven’t had this such a loooooong time!! It was so good! I hope you guys to try this out!! The dressing is so tasty!! Click the link to read about the nutritional benefits of egg plants! Cut eggplants into half crossly and then quarters lengthwise. 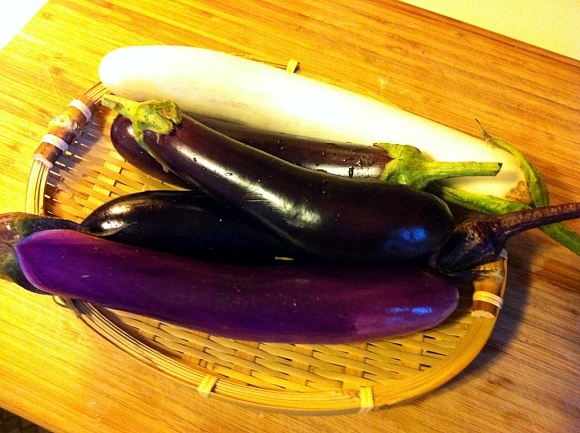 Arrange eggplants in steamer, position over a deep saucepan of boiling water and steam, covered, for about 5 minutes. Do not over cook it then you will lose all the beautiful natural flavor and texture from eggplants. Remove eggplants from steamer and let it cool. Meanwhile, let’s make the dressing. Combine garlic and next 7 ingredients in a medium mixing bowl, stir and set aside. 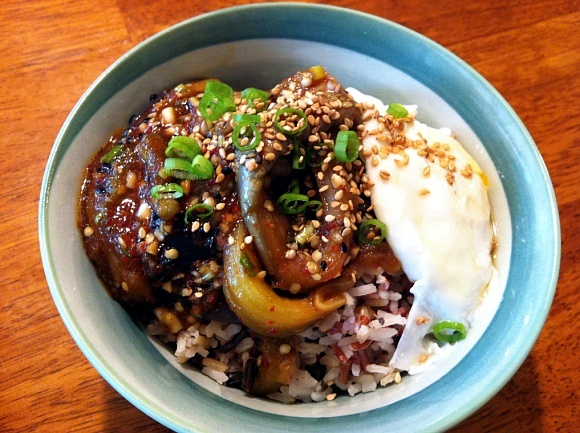 Split steamed eggplants for easy to eat. Put into dressing in bowl and gently mix it all with your clean hand. Serve warm or cold, top with more sesame seeds and green onion as desired. I’m going to go his farm tomorrow morning to pick some eggs. More fresh, YO! haha. I hope everyone have a happy Saturday!!! 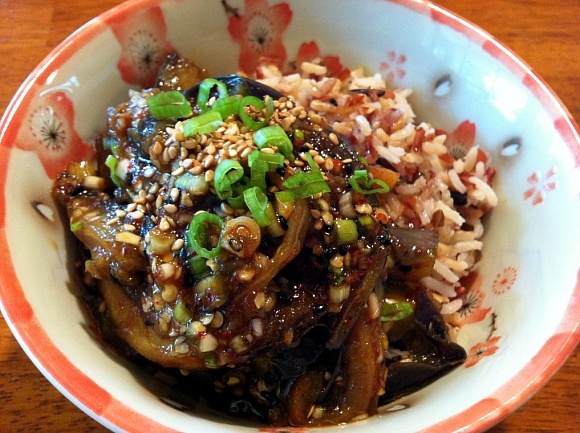 I have so much rice at home and all the other ingredients, I will have to get some eggplant to try this! 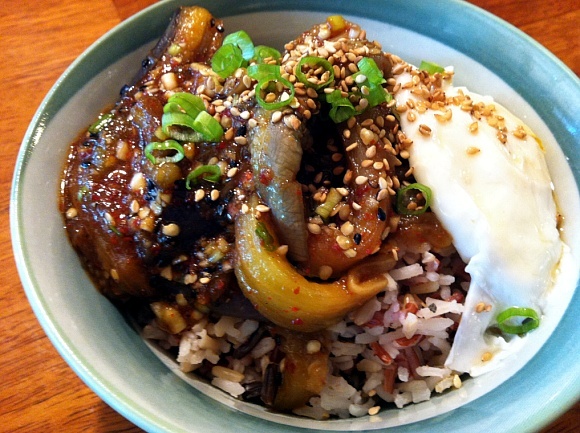 Don’t forget to use Asian eggplant! It’s much tender! How u make the rice? Inhope to get a reply back by 5pm. Lol.. i wanna make this for dinner. 😉 thanks.